← Eat Cheese and Lose the Fat! As a self-proclaimed trivia geek, lists are like candy to me. Top Ten’s, Best Of’s, and Most Interesting Finds can keep me transfixed to the internet for hours. Seems only natural that I would seek out lists which consisted of cheese! Janet Fletcher, author of “Cheese & Wine: A Guide to Selecting, Pairing, and Enjoying” and “The Cheese Course” as well as contributor to The San Francisco Chronicle, has issued her list of diverse and intriguing cheese tastings of 2009. I can hardly wait to head out to my local cheesemonger and sample some of her suggestions! Out of the many cheeses named, I am surprised to have only sampled two. 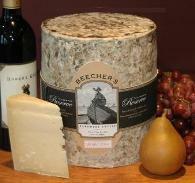 The first, Beecher’s Flagship Reserve (shown above) from Seattle, was this year’s winner of the American Cheese Society’s Mature Cheddars, 25 – 48 months. The second, L’Amuse Gouda from Holland, is a nutty, salty, caramel-y creation which matures in mild temperatures (unlike most Gouda which matures in cool environments). Both were wonderful in their own right although I want to take a second taste before passing further judgment. Check out Ms. Fletcher’s article at the link below and feel free to send any other cheesy list suggestions my way at thehousemouse1@gmail.com! comfortable site to find news on the mystries of the cheese world. So many choices in the display case that many times we choose what we know rather than ask about or taste a sample of those cheeses we do not know. Keep the info coming. The photos help make the unfamiliar, familiar. I don’t have a cheese list but I do hope that you all will check out Fifth Town’s Cape Vessey, which has been getting scores of attention since it’s launch in 2008! Sorry for the very very late reply. Thank you for the heads up and I will be sure to check it out. Keep those tips coming.